Japan fusion alternative energy generation through the muon catalyzed approach continues from two sites around the world. Building on long- and well-understood principles, the researchers feel they have a significant chance of success. Their approach parallels the Australian Star Scientific's initiative but employs a few different techniques. As far as monetary investment goes the main Japan fusion initiative is heavily tied to the ITER project in France. This huge, in size and budget, multinational project employs many Japanese scientists and Japan-based production facilities. The muon mediated approach is an alternative strand with links to some of Japan's nuclear physics history. Muon catalyzed fusion, as covered in the fusion energy section, was propounded as a possibility nearly sixty years ago. The existence of mesons (pi mesons, or pions, being the immediate progenitors of muons) was first proposed by Japanese theoretical physicist Hideki Yukawa. He published his ideas in 1935 and was awarded the Nobel Prize in Physics in 1949 after the theories were proven experimentally in 1947. Hideki Yukawa's mentor, experimental physicist Yoshio Nishina, dicovered the muon in his observations of cosmic rays, separately from the 1936 discoveries of Caltech researchers. Previously he had conducted research with Niels Bohr in Copenhagen. He also brought Niels Bohr, Heisenbergand other physicists to Japan to promote physics thought in Japan. Many units around the world had been seeking to achieve energy production through muon catalyzed fusion knowing it would avoid the high temperatures or huge compressive requirements of other approaches. However nearly all other research teams have given up. In fact muon production occurs in only four laboratories around the world. The earlier laboratories had managed to achieve fusion, usually between deuterium and tritium nuclei. But the energy out was always stubbornly two fifths or 40% of the energy that was put into the system. The reasons for this have been clearly understood. With this seemingly insurmountable barrier most have called it a day. The unique Japanese group RIKEN, founded in 1917 to bring Japan up to speed with the Western world's scientific understanding and achievements, is the driver for the initiative. They have uncovered some optimal criteria for increasing muon effectiveness. Other developments to have come out of the RIKEN laboratory system tend to encourage belief that it could be possible. Researchers within RIKEN are encouraged by the laboratory's philosophy to pursue their own interests and ideas. One recent dramatic result has been in the demonstration of full colour holograms. Anybody interested in real 3D films and television? In the Japan fusion approach the expansive reach of RIKEN laboratory clearly shows. They have a number of sites in Japan. They also work in concert with a number of other countries. The joint approach between Japan and the UK, known as the RIKEN-RAL facility, is the one that has produced results in Japan fusion through its muon catalyzed techniques. 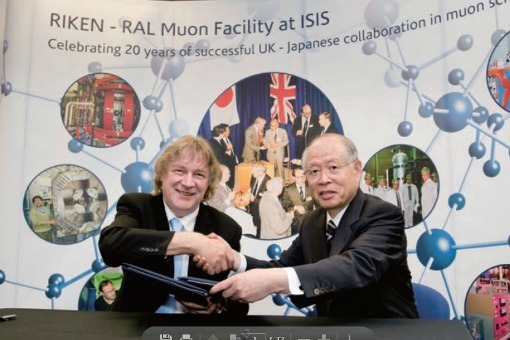 RIKEN-RAL was first established at Rutherford Appleton Laboratories (hence the RAL part) in Oxfordshire, UK, as a co-operative project in 1990. Its initial ten year contract was extended for another decade in 2000. In 2010 both laboratories committed to a further eight years co-operation. Construction of the high density proton accelerator that drives the reactions began in 1991. The first muon beam was observed in November 1994. 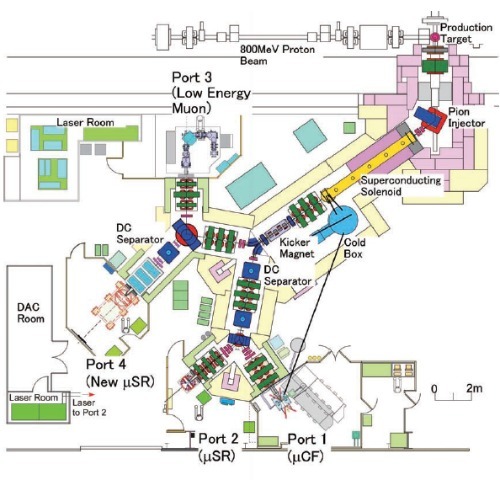 Further development work continued with the beginning of muon catalyzed deuterium tritium fusion experiments in June 1996. Muon catalyzed fusion was only one of its purposes. The accelerator has four exit ports, each designed to be used for distinct experimental purposes. As mentioned before in fusion energy, muons occur naturally in nature from the influence of cosmic rays. The largest amount of cosmic ray energy arriving in our atmosphere is composed of protons. As these interact with nuclei in the atmosphere they create incredibly brief-lasting pions (previously pi mesons). These rapidly spontaneously decay into muons and muon antineutrinos. Muons last somewhat longer, around two hundred times, than pions, finally decaying into electrons, electron antineutrinos and muon neutrinos. In nature, muons are passing through our bodies every second. Muon mass is 1.8857 x 10-28 kg, 207 times that of an electron mass at 9.1095 x 10-31 kg, and one eighth of a proton mass at 1.6726 x 10-27 kg. Both negatively charged and positively charged muons can be created. The Japan fusion muon process, as with all other muon catalyzed experiments, uses the negative muons. These vastly heavier particles can replace the negatively charged electrons in orbit around a hydrogen nucleus. The greater mass causes a muon to orbit much closer to the nucleus, forming effectively a much smaller atom. Its negative charge can shield the positive charge of the proton nucleus, allowing it to approach close enough to another hydrogen nucleus, especially in molecular associations, to allow the strong nuclear force to operate. The muon is released to interact with another atom. All experimentation involved so far has used either the deuterium hydrogen isotope (with the added neutron in the nucleus) or deuterium along with tritium (with two neutrons bound to the hydrogen proton). The more neutrons, the larger the strong nuclear force becomes. Tritium, being a radioactive particle, is handled by specially certified laboratories designed to safely store it. The Japan fusion RIKEN-RAL laboratory has those facilities. As mentioned elsewhere the alpha particle, or helium 4 nucleus, that results from the fusion reaction tends to bind the muon at times. Called stickiness, this limits the lifetime the moving muon can interact to cause fusion reactions. In experiments at RIKEN-RAL this has proven to be around 120 fusion interactions. Consequently the energy output is only 40% of the energy required to generate the pion and subsequent muon. If some way could be designed to ensure the muon is released from alpha particle it would tend to head to near break even energy out. As in standard fusion results, increasing the fuel density increases the chance of a fusion interaction. The simplest way to obtain this is by increasing the pressure the fuel is housed at. Increased pressure also results in higher melting and boiling points. These higher state end points also allow the reaction to be run at a higher, more efficient temperature. 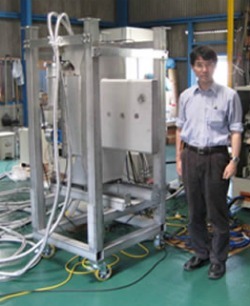 The current head (since 2004) of the research unit for Japan fusion at RIKEN-RAL is scientist Teiichiro Matsuzaki. He was involved in the original accelerator construction at the facility. He would like to test the fuel mix at around 1000 atmospheres, knowing that even a five times increase in density would lead to around 1200 interaction per muon lifetime. In more recent news RIKEN built another proton accelerator, this time in Japan. Constructed in 2008, the J-PARC (standing for Japan Proton Accelerator Research Complex) suffered significant damage in the February 2011 eastern Japan earthquake. Over a year was spent in repairing the structure with some further minor adjustments required since then. Japan fusion through muon catalyzed methods arises from a long history of theoretical and experimental involvement in particle physics. Modifications to the Japan fusion initiative should produce some useful results which could well provide a significant alternative energy source for another take on nuclear fusion.